Neuroendocrine carcinoma. Atypical carcinoid tumor. Larynx. Surgery. Introduction: Atypical carcinoid tumor is a rare neoplasm in the larynx. They are aggressive tumors with early metastases mainly for cervical nodes. Objective: Describe a case of a patient with a atypical carcinoid tumor in the larynx without neck involvement, where a conservative surgery treatment was a opted. We analyzed its clinical evolution after three years. Case Report: A 45-years-old male developed a lesion in right arythenoid whose histological diagnosis was a atypical carcinoid tumor. The treatment realized was total arythenoidectomy. No clinical or radiology recurrence was noted after 3 years. Conclusion: It's an uncommon neoplasm in the larynx, that a conservative surgery treatment was choice, without recidive after 3 years of clinical evolution following with laryngeal endoscopy, radiology and radioisotope studies. Neuroendocrine neoplasms are tumors which hold a range of morphological, functional and behavior features. Their diagnosis depends on recognizing the morphological features and on the presence of indicative signs of neuroendocrine difference. Neuroendocrine neoplasms of the larynx are classified according to their origin: either epithelial or neural. Since Blanchard and Saunders, in 1955, first described them, there have been many changes. Nowadays, World Health Organization (WHO) (1991) suggests the use of the following terms: typical carcinoid tumor, atypical carcinoid tumor, carcinoma of small cells and paganglioma(1,2,3). Atypical carcinoid tumors in the larynx are rare neoplasms, counting around 200 cases in the literature. They affect mainly males in a 3:1 ratio and are considered aggressive with early metastasis especially for cervical lymph nodes. The suggested therapy in the literature covers surgery followed by selective or radical cervical empyting(1-7). 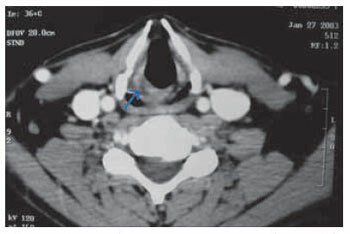 In this study it is reported a case of patient with atypical carcinoid tumor in the larynx without affecting cervical lymph node. Conservative surgery was the therapy chosen and its evolution was observed for 3 years. A 45-year-old male from São Paulo city - Brazil, reported history of foreign body sensation in the throat for 5 months, associated with pyrosis, with no dyphagia or dysphonia. He had been socially drinking for 7 year and smoked for 10 year (two packs a day); with no previous or family history of neoplasm; no fever or weigh loss. He sought for medical care and had his high digestive endoscopy done, which showed lesion in the larynx. The anatomopathological study of lesion biopsy resulted in a non-specific chronic inflammatory process. He underwent oral corticoid therapy and omeprazole for one month, but no symptoms improvement. Then he came to our service. During ENT examination cervical masses were not touched and rigid endoscopy exam of the larynx showed a 5cm diameter pedunculated lesion in the right arytenoid cartilage and aryepiglottic fold (Picture 1). 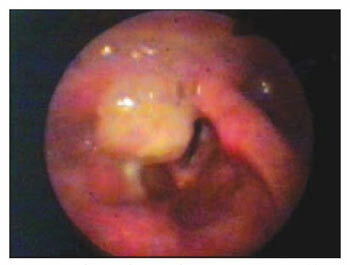 Vocal cords were movable and without mucosa lesion. It was done a removal biopsy of lesion under direct laryngoscopy. During operation, the surgical specimen was frozen, what supposing a malignant neoplasm. The final result of the anatomopathological exam in paraffin was moderate neuroendocrine carcinoma (atypical carcinoid) with positive immunohistochemical analysis for calcitonin and chromogranin. After such diagnosis, cervical CT was done and it did not show lymphadenomegaly with thickness in the right arytenoids area (Picture 2). Patient did not present any symptoms or dysphagia or dispnea and rigid endoscopy exam of the larynx did not show presence of lesion. Although he presented all these results, one month after first surgery, CO2 laser arytenoidectomy was performed under direct laryngoscopy in order to obtain surgical limits of the tumor. Anatomopathological exam of the surgical specimen did not present any neoplasm. Picture 2. Presence of thickness on right arytenoid area (arrow), after removal biopsy of lesion. Due to the absence of metastasis signs during clinical, larynx endoscopy, tomography and nuclear medicine (mapping with metaiodobenzylguanidine) exams, clinical follow-up was done, approved by patient who did not present recurrence sign of lesion for three year after surgery. Atypical carcinoma in the larynx occurs in more than 90% of the cases in the supraglottic area, prevailing on the aryepiglottic fold, arytenoids and larynx side of epiglottis. It is more common in males (3:1 ratio), especially smokers. The current patient was 45 years old, though in the literature the incidence occurs between the ages of 60 and 70(1,3). Symptoms depend on the place lesion. Patients can present dysphagia and dysphonia, though the current patient did not present them. Glossopharyngeal neuralgia can occur before tumor being clinically clear. Samous cells carcinomas in the larynx does not usually cause pain unless they are extensive or associated with erosion of laryngeal cartilage and/or hypopharynx extension, therefore, small tumors associated to pain can cause other diagnosis such as neuroendocrine carcinoma. Once again, the current patient did not report any pain. For being tumors from cells which are part of a diffuse neuroendocrine system know as APUD (amino precursor uptake and decarboxylation), carcinoid syndrome in this type of tumor might occur(1,3). Atypical carcinoid tumors are usually sub epithelial, and normal epitheliums over it can occur(3). The first biopsy performed on the current patient was not conclusive, for probably being superficial. It is important to perform a deep biopsy in order to guarantee anatomopathological diagnosis. Microscopy of atypical carcinoid tumor shows Zellballen-type cells which also occur on paragangliomas. That is why there is a misunderstanding when diagnosing them(1-7). Though, besides paragangliomas present better prognosis, they do not present positive signs in the immunohistochemical analysis for calcitonin and cytokeratin. Other types of differential diagnosis should cover: granuloma, papilloma, anaplasic scamous carcinoma, Medullary carcinoma of the thyroid, malignant melanoma and metastatic renal cell carcinoma(3). Atypical carcinoid tumors should be treated through surgery. The conservative surgery can be performed if tumor is properly removed. Large tumor may require total laryngectomy(6). Atypical carcinoid tumor tends to cervical metastasis. Ferlito et al. (6) found an involvement of 80% of cervical lymph nodes and Woodruff et al. (7) found 43%. It is suggested radical emptying if the lymph nodes are affected. Selective emptying for negative lymph nodes is suggested due to the high rate of metastasis(1-7). Skin metastasis occurs in 22% of the cases and comprehends a worse prognosis. Tumors larger than 1 cm7 are another important fact which reduces the rate of patient survival. The current patient underwent conservative surgery due to neoplasm absence after total arythenoidectomy and distant metastasis, and also for being a rare tumor in the larynx, whose therapy is still questionable. Radiotherapy or chemotherapy is not effective in this type of tumor(1). New exams of nuclear medicine such as mapping with metaiodobenzylguanidine and cintilography with radio-labeled somatostatin have been used in order to detect carcinoid tumors and evaluate possible metastasis. Patient did not present distant metastasis after the first exam. A case of rare neoplasm in the larynx in which a conservative surgery was chosen as therapy with no recurrence of lesion even after 3 years of follow-up through laryngeal endoscopy, tomography and cintilography exams. 4. Teacher of ENT Discipline at Faculdade de Medicina da Universidade de São Paulo (Associated Teacher of ENT Discipline at FMUSP). 5. Teacher of ENT Discipline at Faculdade de Medicina da Universidade de São Paulo (Associated Teacher of ENT Discipline at FMUSP). Hospital das Clínicas da Faculdade de Medicina da Universidade de São Paulo - Clinical Hospital of the medical school of University of São Paulo. This article was submitted to SGP (Sistema de Gestão de Publicações - Publication Management System) of R@IO on April 11th, 2007 and approved on October 12th, 2007 at 05:24:50.